Parental favouritism is a common concept to many of us who have grown up thinking our parents have given preferential treatment to a sibling. Sometimes, our perceptions are accurate but other times not very realistic. Where they are accurate though, the consequences can be more than just a grudge or sibling rivalry. They can actually be linked to depression as an adult. Where a mother has favoured one child, all children can often sense this preferential treatment. The result is that they are more likely to grow up to become adults who show depressive symptoms. At least, this is according to a recent study in the United States. Researchers surveyed nearly three hundred families and found that the harmful effects of favouritism from a mother can be persistent well into the adult years of the children. Previous studies have found that kids and teenagers can experience depressive symptoms where a parent shows favouritism. But this new study is an important one because it suggests that these feelings can persist well into adulthood. While we might think it is only the unfavoured children who suffer, researchers cite that all children suffer from a mother’s favouritism. The sensing of this unequal treatment can have profound effects on all of the children in the family, even after they leave home and start their own families. When a child is not favoured, he or she may suffer by feeling resentment towards the mother and the other children in the family. 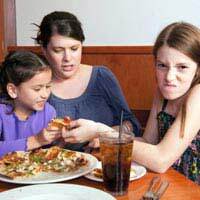 Those children who are favoured then have the additional burden of potential aggression from the unfavoured siblings. The unfavoured children may feel less friendly and close to the favoured children than they would if the mother was giving equal treatment to everyone in the family. Researchers are concerned that because the idea of favouritism is so taboo in society, there is a tendency not to talk about it. Parents will fiercely deny any favouritism and this lack of openness and transparency is even more dangerous. It means we don’t address the issues and they continue to do damage to children long after they leave home as adults. It is easier said than done to avoid favouritism. Even after bringing these issues into the open, when researchers surveyed mothers they found that seventy percent of the mothers felt closer to one child. Supporting this notion is that only fifteen percent of the children felt they had received equal treatment from their mother. To say the issue is a small one would clearly be a major understatement. The hope from this particular study and related ones is that by bringing the issues out into the open and addressing this wide discrepancy between family relationships, we can find better kinds of therapy for families. Prevention will be particularly challenging but we may at least be able to find better ways to help families later in life after the children have grown up and left home. My mother used to do partiality between me and my younger brother in terms of food.How to solve this problem?